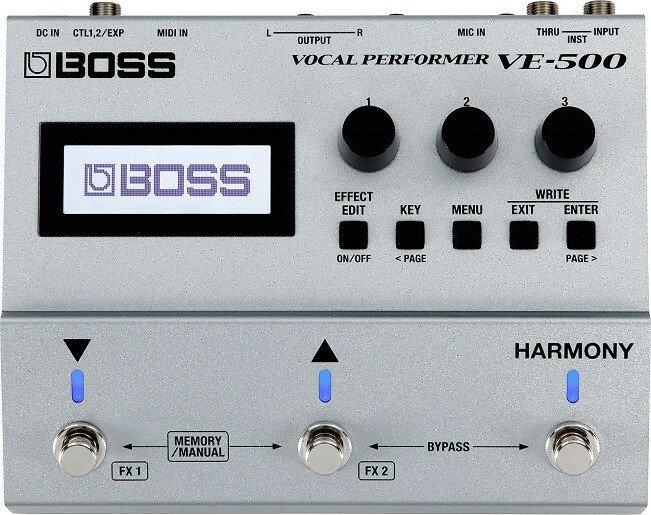 Processador Efeitos Boss VE-500 Vocal Performer. The advanced VE-500 Vocal Performer provides everything you need to achieve impressive vocal harmonies and effects on stage, and all in streamlined stompbox that integrates seamlessly with the regular guitar effects on your pedalboard. If you’re like most guitarists, you spend a lot of time choosing the right amps and pedals to craft your own personalized sound. But if you sing in your band as well, it hasn’t always been so easy to give your vocal sounds that same attention to detail - until now. The advanced VE-500 Vocal Performer provides everything you need to achieve impressive vocal harmonies and effects on stage, and all in streamlined stompbox that integrates seamlessly with the regular guitar effects on your pedalboard. 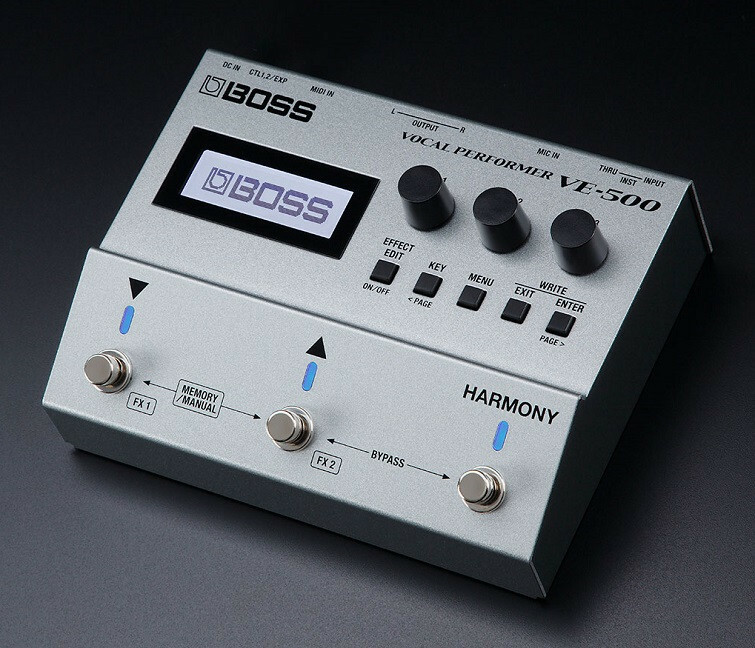 Packing professional sound quality and serious BOSS DSP muscle, the VE-500 delivers sophisticated harmony and pitch correction functions that automatically track the chords you play on your guitar. It also includes a powerful vocoder and core sound-enhancement tools, plus world-class reverb, delay, and modulation sounds and specialty effects like distortion, filtering, and many others. And with programmable memories, you can instantly recall favorite setups for any song or style. The VE-500 is the perfect addition to the pedalboard of any singing guitarist, providing top-flight vocal processing that fits right alongside your standard guitar effects. Filled with deep sound-shaping capabilities, the VE-500 is a professional vocal toolkit that lets you process your voice any way you like, from subtle sweetening to the dramatic, over-the-top effects heard on so many modern records. And with its newly enhanced harmony and pitch engine, you can easily expand your sound with real-time vocal harmonies and more. The VE-500’s stompbox configuration makes it simple to integrate with any pedalboard - just plug your guitar into the instrument input to drive the harmony, pitch, and vocoder functions, and then use the Thru output to feed an unprocessed signal to your other pedals. And with the VE-500’s stereo XLR outputs, you’re able to send your processed vocal sounds directly to a PA mixer, stage monitor, or recording device. Are you short of good backing singers in your band? The VE-500 is the perfect solution, making it easy to elevate your songs with rich, ear-catching vocal harmonies. Its automatic harmony engine is powered by advanced BOSS processing that detects the chords and key you play with your guitar, generating smooth and natural two- and three-part harmonies in real time as you sing. 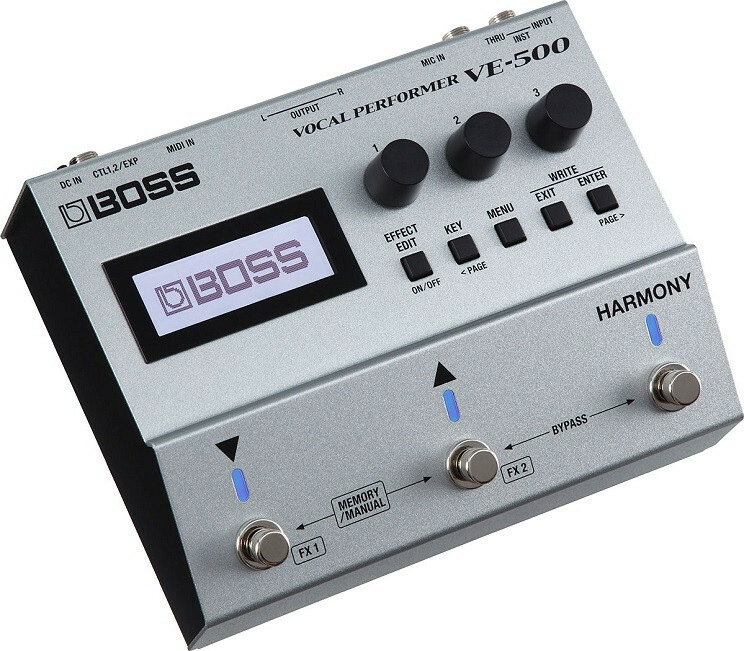 And by working with the VE-500’s different harmony modes, you’re able to refine the harmonies as needed for songs that have more complex key structures. The harmony engine can alternately be driven via MIDI (through either the VE-500’s MIDI or USB inputs), enabling you to generate pitch-perfect live harmonies with a MIDI keyboard or DAW-based backing tracks. The VE-500 contains wide-ranging effects with deep editing parameters for crafting nearly any vocal sound imaginable. In addition, highly flexible routing options are available for processing live and harmonized vocals together or separately. Use the Enhance section to polish your voice with essentials like compressor, de-esser, and EQ, then tap into the two dedicated Reverb/Delay sections for everything from subtle coloration to lush, expansive clouds of ambience. Four independent FX engines are available as well, and each contains an enormous selection of effects types. Spice things up with a little chorus, flanger, or tremolo, add some secondary reverb or delay, or take things over the top with distortion, radio voice, ring mod, slicer, filtering, and more - the sky’s the limit! 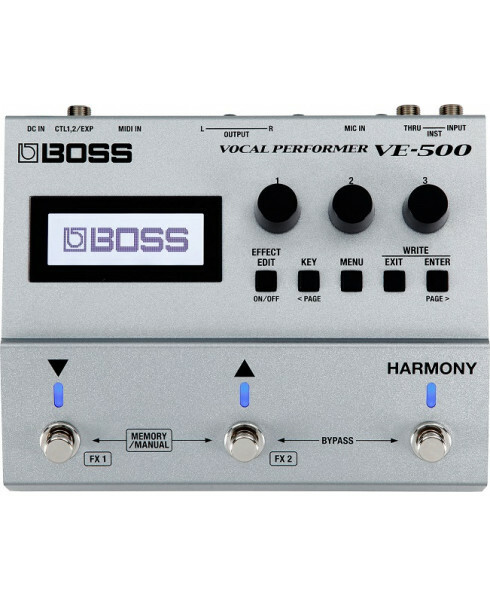 Another killer VE-500 feature is its powerful vocoder function, which is derived from BOSS’s unique and innovative VO-1 Vocoder pedal. By vocalizing into the connected mic as you play, you can transform your guitar’s tone with electronic voices and an array of all-new colors for modern music styles. It’s even possible to replicate traditional talk box sounds, providing instant access to classic “talking lead guitar” tones without having to use a talk box rig and mouth tube. The VE-500 also includes a dedicated pitch correction section, which is guided via guitar or MIDI just like the harmony function. You can employ it for transparent pitch stabilization, which is especially useful if you’re not such a great singer but still need to contribute some lead and/or backing vocals to your band’s sound. It’s also possible to switch in alternate modes that provide the heavily effected sounds heard on modern hits, including hard pitch correction, electronic tonalities, and even robot-voice sounds. With the VE-500’s large display and panel knobs/buttons, it’s simple to create and call up sounds. After you’ve dialed in the perfect setup, simply save it to one of 99 user patch locations for instant recall while performing. Editor/librarian software is available as well, allowing to tweak and organize sounds from your Mac or Windows computer. The three panel knobs can be assigned to favorite parameters, enabling on-the-go tweaks in the heat of the moment. Three integrated footswitches offer access to a multitude of functions, including patch selection, individual effects on/off, harmony and looper functions, and more. Expanded control is also possible with external footswitches, an expression pedal, or MIDI. AF method (Adaptive Focus method) is a proprietary method from Roland & BOSS that vastly improves the signal-to-noise (SN) ratio of the AD and DA converters.